The highlight of my Sunday is a trip to do my grocery shopping. I know not everyone would share my enthusiasm for the weekly shop, particularly if that means queuing at a local Coles or Woolies. However, my grocery shop involves a local farmer named Hapi. Hapi lives up to his name and always has a smile on his face as he tells me about what seasonal produce he has on offer at the Farmers Market that week. Hapi tells me all about his dryland farming and how most of his produce is produced organically and if it isn’t deemed to be organic then why not. I feel fortunate to have access to Hapi and the other farmers at Marrickville Markets in Sydney’s inner west as it has taught me a lot about the importance of understanding where our food comes from. Before the markets I can’t say that I have had much interaction with farmers; much appreciation for seasonality, and that I may not be able to get my fresh blueberries all year round or that there was a reason the beloved hass avocado is replaced with a shepard at certain times during the year. I know I am not the only one that would feel this way, but why is that? As city dwellers, convenience is usually always at our door step. We don’t even need to leave the house to order our groceries or have a delicious meal cooked for us. Technology and mobility has made it so easy for us to be disconnected from where our food comes from. So how can we as planners and urban designers change this? And why is it important that we do? 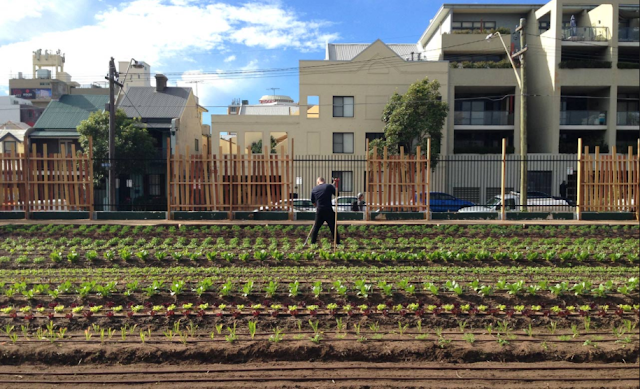 Urban agriculture is on the rise globally, with more and more farms appearing in our cities. Social, economic and environmental benefits allow urban agriculture to contribute to the multifunctionality and sustainability of cities. In terms of land use planning, multifunctionality is a great asset, and urban agriculture can deliver a variety of potential benefits simultaneously (van den Berg 2000), making it a ‘cheap’ producer of public goods (Moustier and Danso 2006). Urban farms, which are different to allotments and community gardens, occupy much bigger spaces; they can employ people, regenerate huge neighbourhoods and give residents access to fresh produce on their doorsteps. Numerous land uses are associated with urban agriculture, including city farms, verge farming, community composting, farmers’ markets, rooftop garden, keeping of animals (e.g. poultry and bees), etc. As a result, there are numerous ways in which land use planning can encourage, support, regulate and hinder urban agricultural practices. In Australia, intentional urban agriculture planning is at a very early developmental stage, with no comprehensive policy or strategy and only a small proportion of local governments in capital cities having community garden and farmers markets provisions. The main hurdle is to recognise urban agriculture and all of its practices as a desirable land use, rather than an incidental one. In our master planning and rezoning proposals here at DLA these types of uses could be included within our proposals to/ or on behalf of Councils, but encouraging these types of uses through our statutory work may be more challenging due to existing land use restrictions etc. Through recognition and understanding of urban agriculture practices, existing regulatory provisions could be altered to facilitate urban agriculture development. This could be achieved through recognition by local governments of the importance of urban agriculture in its areas. It would require investment in education particularly of decision-makers, planners and the community on its practices, benefits and risks. So why is urban agriculture important and why should policy makers consider it? Urban agriculture encourages sustainable and healthy compact cities, helping to reduce food miles. Urban farms act as a social incubator, bringing together communities and connecting cultures. Many also impact significantly on health and well-being, allowing city-dwellers to access fresh food and understand where the food comes from and how it is grown. The practice has been popular in North America for many years, with many huge rooftop farms surrounding New York City. Brooklyn Grange for instance, produces close to 23,000kg of organic vegetables each year, and the world’s largest urban farm recently opened in Chicago. These types of uses also foster innovation; a good example of this is Farm Urban in Liverpool, which is using leftover land (including the University of Liverpool Student Union’s rooftop) for aquaponics: a man-made, symbiotic system where plants and aquatic animals such as fish can nourish each other. Many urban agriculture initiatives are increasingly using hydroponics and other forms of technology to grow food more efficiently. Those adopting a highly technical approach appear to be more sustainable than other types of urban farms. Closer to home Pocket City Farm is an urban farm in Camperdown, Sydney’s inner-west. The farm is part of Camperdown Commons, a community rejuvenation project that is an initiative of the Canterbury-Hurlstone Park RSL. It shares the space with the RSL-managed Common Spaces, which offers local community groups, businesses and not-for-profits on-site spaces to meet and hold events, and with acre, the adjacent eatery that overlooks the farm. acre uses the farm’s organic produce in their seasonal menus and contributes to the farm’s composting and recycling programs. Collectively, they also run seasonal events together. Pocket City Farms connects with the local community in as many ways as they can. They run yoga classes and community education workshops for kids and adults (current events include: How to Grow Greens; Native, Stingless Beekeeping, and; Biointensive Growing). 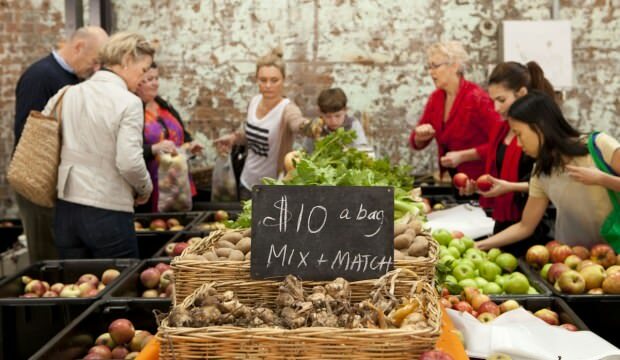 They have monthly crop swaps on-site, sell their produce to local cafes and restaurants across the inner west and have school groups, corporate and community groups use the space for outings. The Farm was created by a desire to grow food locally and to help create more points of connection with the production of our food. The capacity of urban farms to tackle major social and sustainability issues should not be underestimated. Global, national and local initiatives mean we’re likely to see more of these urban farms appearing across the world – improving city dwellers lifestyles, impacting positively on the local economy and regenerating neglected spaces. We look forward to encouraging these spaces in our development proposals. Would you like to see these spaces in your local area? Do you have other examples you could share with us?